The Takamine bass guitar EG512CFG is an outstanding acoustic bass with the Takamine heritage and industry-leading quality construction. This musical instrument features a spruce top and flame maple (natural finish) back & sides, all topped off with an incredible electronics system. The onboard TK-4N Preamplifier features a built-in tuner; volume control; bass, middle and treble frequency slider controls; EQ bypass; a Notch Filter and a Mid Contour Switch. The tuner in the TK4N-T is fully chromatic and automatic. The Takamine bass EG512CB is an outstanding acoustic bass with the Takamine heritage and industry-leading quality construction. It features a spruce top and maple (black finish) back & sides, all topped off with an incredible electronics system. The onboard TK-4N Preamplifier features a built-in tuner; volume control; bass, middle and treble frequency slider controls; EQ bypass; a Notch Filter and a Mid Contour Switch. The tuner in the TK4N-T is fully chromatic and automatic. all topped off with an incredible electronics system. The Takamine bass EG512C features a spruce top and nato (natural finish) back & sides, all topped off with an incredible electronics system. The onboard TK-4N Preamplifier features a built-in tuner; volume control; bass, middle and treble frequency slider controls; EQ bypass; a Notch Filter and a Mid Contour Switch. The tuner in the TK4N-T is fully chromatic and automatic. 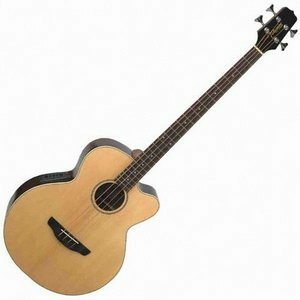 It is an outstanding acoustic bass with the Takamine heritage and industry-leading quality construction.